Pickmere Country Guest House v Knutsford, Anglie: Zarezervujte nyní! Pickmere Country Guest House is a grade ll listed Georgian former farmhouse situated in the centre of Cheshire in the village of Pickmere and is ideally placed for exploring all that Cheshire has to offer. It is close to the motorways of M6 J19 and M56 J10 and Manchester and Liverpool’s airports are 20 and 40 minutes away respectively. There are many National Trust properties in the area including Tatton Park, Dunham Massey, Little Moreton Hall, Lyme Park and Quarry Bank Mill.Other attractions include Arley Hall & Gardens, Anderton Boat Lift, Lion Salt Works (when it opens), Chester Zoo , Blue Planet Aquarium, Jodrell Bank Chester and many other places. All the rooms are individually styled with many pieces of antique furniture. 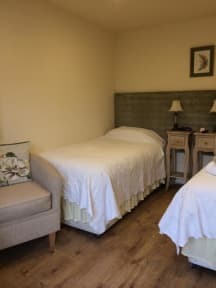 There are 8 en suite double/twin rooms (2 are family rooms) and 3 single rooms with either private or shared bathrooms. There is a guest lounge and dining room where full English breakfast is served. 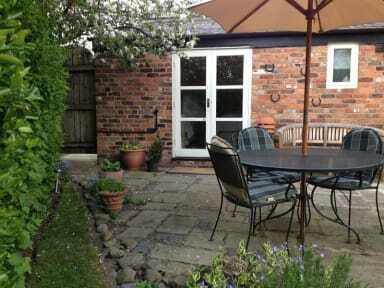 The guesthouse can also cater for lunches, afternoon teas and dinners by prior arrangement. Guests can arrange earlier and later check-in times with prior notice.